The Old Dairy, is a beautifully converted former dairy. Built from flint and brick and finished to a high quality The Old Dairy is the perfect place to unwind with family or friends. A few days spent exploring the local attractive seaside town of Emsworth or Bosham is the perfect antidote to a busy life. 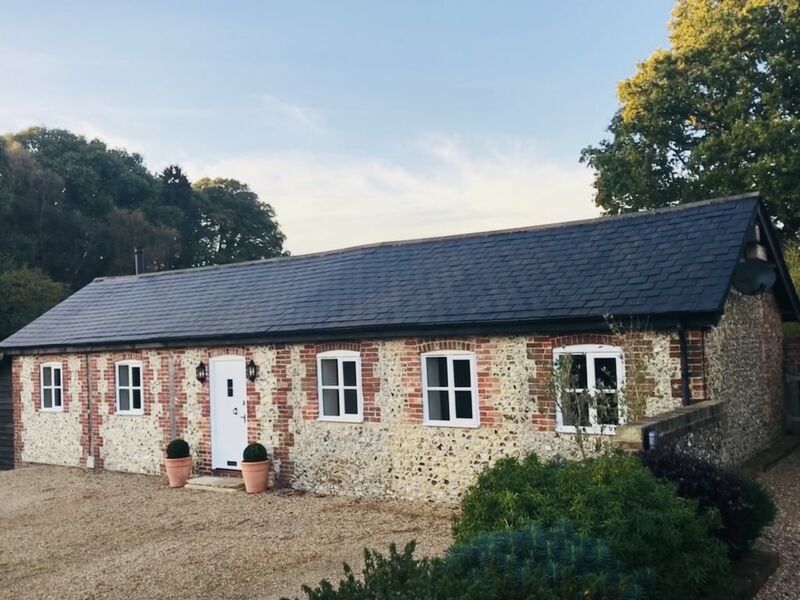 Comprising 2 luxurious bedrooms both with bathrooms and a spacious open plan living and dining area with a log burner, winter evenings are guaranteed to be cosy and during the warmer months a courtyard garden with rural views is the ideal place for a morning coffee. For those of you wanting a bit of luxury our hot tub is heated to a very comfortable 39 degrees and makes for great star gazing. So many thoughtful and kind touches throughout from owners that obviously value their guests’ comfort highly. Can’t praise The Old Dairy enough. We stayed in Westbourne last week during the hottest spell I can ever remember in March. We are a pair of OAPs and had never experienced a hot tub before. It was so easy to use and marvellous on our old bones after a long day's walking. The cottage itself is lovely. Everything you could wish for is to hand and, most importantly I think when away on holiday, we slept well because of the peaceful surroundings and comfy beds. It's easy to get to the coast and we even popped over to the Isle of Wight for a day at the Needles. Big tip here - use your Tesco Vouchers. The crossing for us two and the car was 75 pence!!!!! We spent a whole day around Portsmouth Harbour/Dockyard going up and down the Spinnaker Tower as often as we liked on the ticket. All in all we loved the Cottage and the Location. Go For It. Stayed for three nights. The Barn has everything you could want to a very high standard. The hot tub occupied one of the group members for most of the stay, indeed I awoke early on the Sunday morning to him already in the hot tub, which was worrying, but an endorsement for the property. The Old Dairy had everything we needed for our two night stay. The cottage was fully equipped for self catering, lots of room for four of us, warm and cosy and the hot tub was a real bonus. We (2 couples) stayed at the Old Dairy for two nights and would have happily stayed for longer. The weather was very cold and the underfloor heating and log burner was perfect to keep the whole place warm. The fully equipped kitchen meant we could easily cook a meal, although we chose to eat in the White Horse pub in Westbourne, as recommended by the owners. The food there was excellent. The location was really good with lots of walks nearby, we drove in to Emsworth and walked around Thorney Island. Lots of places to eat in Emsworth too. I really enjoyed my stay at the Old Dairy, it was a lovely cottage with everything we needed, the local area was really nice, the village with it's 3 pubs was very welcoming and Kate and Dan were really helpful both whilst booking and during out stay. From the minute we arrived we knew we had found a hidden gem. Stunning, absolutely everything you need, convenient for visiting where we needed to be. We had an amazing, chilled weekend. Faultless. Absolutely fabulous place to stay. Very comfortable. We loved staying in 'The Dairy'; a lovely & beautiful restored flint detached property in the Sussex countryside. The quality of everything is superb and very comfortable. The hottub is a real hit. The owners were very welcoming. Would highly recommend and we shall definitely be back. Great base to explore Chichester, The South Downs, Brighton, Portsmouth and the historic dockyard.